The founder president of BJP, former Prime Minister, beloved leader of millions, Bharat Ratna Shri Atal Bihari Vajpayee, one of India’s most charismatic and tallest leaders who led the nation through several crises while holding together a tenuous coalition with his inclusive politics and superlative oratory, left for his heavenly abode in New Delhi on 16 August, 2018. He was 93. It was this nationalist stalwart Shri Atalji’s exemplary leadership that set the foundations for a developed, prosperous and inclusive India in the 21st century, for which his popularity was cut across party lines. Shri Vajpayee was admitted on June 11, 2018 with a kidney tract infection, urinary tract infection, low urine output and chest congestion at the All India Institute of Medical Sciences (AIIMS) hospital in New Delhi. Shri Vajpayee, had also only one functional kidney. He suffered a stroke in 2009 that weakened his cognitive abilities. On 15 August, when Atalji’s condition became critical, PM Shri Narendra Modi, BJP National President Shri Amit Shah all the senior leaders of BJP, a host of politicians from the Opposition and well-wishers gathered at AIIMS to enquire about his health condition and wish him speedy recovery. A pall of gloom descended at the BJP headquarters and throughout the country as soon the news of Shri Vajpayee’s demise broke. 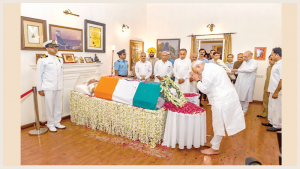 From AIIMS, on 16 August evening the mortal remains of the former Prime Minister were taken to his residence at 6-A Krishna Menon Marg in New Delhi where host of leaders cutting across party lines and people from different walks of life paid their last respects. The Central government announced seven-day state mourning from 17 August and various state governments announced a day’s holiday as a mark of respect to the former Prime Minister Shri Vajpayee. During this period, the national flag was flown at half-mast at all offices and institutions throughout the country. All the central government offices were functional only for half day. 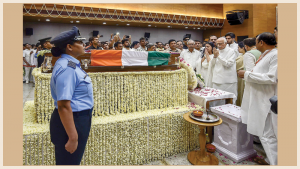 On 17 August morning draped in a Tricolour, the mortal remains of Shri Vajpayee were taken to the BJP national headquarters at Deendayal Upadhyay Marg for the general public and the VIPs to pay their last respects to the departed soul. PM Shri Narendra Modi, BJP National President Shri Amit Shah and all top leaders of the country received them. 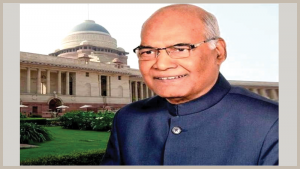 President Shri Ram Nath Kovind, Prime Minister Shri Narendra Modi, RSS Sarsanghchalak Shri Mohan Bhagwat, BJP National President Shri Amit Shah, BJP veterans Shri LK Advani, Dr. Murli Manohar Joshi, Congress President Rahul Gandhi, UPA chairperson Sonia Gandhi, all Central Ministers, Chief Ministers, Governors, Opposition Leaders, eminent citizens from various fields of the country and several top foreign leaders paid their last tributes to Shri Atal Bihari Vajpayee at the BJP national headquarters at Deendayal Upadhyay Marg in New Delhi. Former President Shri Pranab Mukherjee, former Prime Minister Dr. Manmohan Singh, Lok Sabha Speaker Smt. Sumitra Mahajan, Home Minister Shri Rajnath Singh, External Affairs Minister Smt. 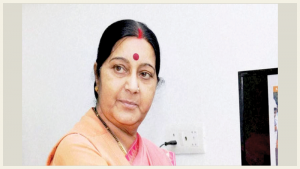 Sushma Swaraj, Defence Minister Smt. 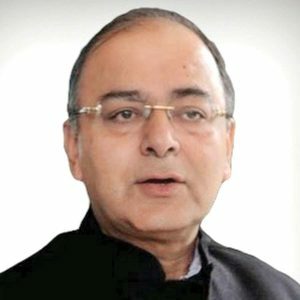 Nirmala Sitharaman, Andhra Pradesh CM N Chandrababu Naidu, West Bengal Chief Minister Mamata Banerjee, Bihar CM Nitish Kumar, Shiv Sena Chief Uddhav Thackeray, Odisha Chief Minister Naveen Patnaik, Former Jammu and Kashmir Chief Minister and PDP leader Mehbooba Mufti, Congress leaders Ghulam Nabi Azad, Mallikarjun Kharge and Anand Sharma, Lok Sabha Deputy Speker M. Thambidurai, former Union Minister A. Raja, MDMK chief Vaiko and TMC leader Dinesh Trivedi, Army Chief Bipin Rawat, Chief of Naval Staff Admiral Sunil Lanba, National Security Advisor Ajit Doval also paid their last tributes. Delhi Chief Minister Arvind Kejriwal, Deputy CM Manish Sisodia and AAP MP Sanjay Singh paid the last respects to former Prime Minister Atal Bihari Vajpayee at BJP Headquarters. Foreign dignitaries like Bhutan King Jigme Khesar Namgyel Wangchuk, former Afghanistan President Hamid Karzai, Nepal’s Minister for Foreign Affairs Pradeep Kumar Gyawali, Sri Lanka’s Acting Foreign Minister Lakshman Kiriella and Bangladesh Foreign Minister Abul Hassan Mahmood Ali also paid their homage. People from across the country also gathered in huge numbers outside the BJP head office and thousands lined up inside to pay homage to the former Prime Minister. Condoling the demise PM Shri Narendra Modi said Shri Vajpayee’s passing is a “personal and irreplaceable” loss for him and that his futuristic policies across various sectors touched the lives of each and every citizen of India. It was due to the perseverance and struggles of Atal Ji that the BJP was built brick by brick. He travelled across the length and breadth of India to spread the BJP’s message, which led to the BJP becoming a strong force in our national polity and in several states,” he added. Shri Vajpayee, who joined the Rashtriya Swamsevak Sangha in 1947 rose through ranks to become a stalwart of the BJP and was the first non-Congress Prime Minister to complete a full term in office. In 1996 Shri Atal Bihari Vajpayee first became Prime Minister leading a shaky coalition government. It lasted for 13 days and collapsed after losing a vote of no-confidence. His second stint as Prime Minister was in 1998 when the National Democratic Alliance (NDA) again came to power but that lasted for just 13 months. Finally, the BJP led NDA with Shri Atal Bihari Vajpayee as PM returned to power in 1999 and completed a full turn in government till 2004. In 1975, Shri Vajpayee was arrested along with several other opposition leaders during the Internal Emergency imposed by Prime Minister Indira Gandhi of the Indian National Congress party. Emergency ended in 1977. 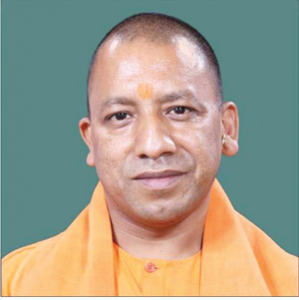 A coalition of parties, including the BJS, came together to form the Janata Party, which won the subsequent general elections. Morarji Desai, the chosen leader of the alliance, became the prime minister. 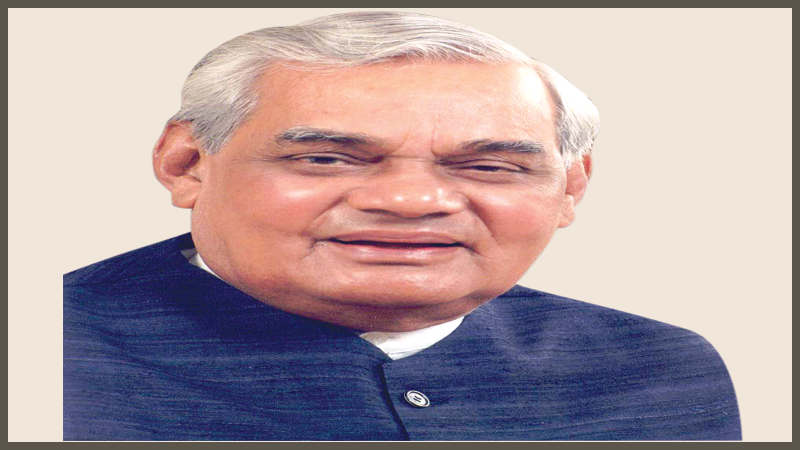 Shri Atak Bihari Vajpayee served as the Minister of External Affairs, in Desai’s cabinet. As foreign minister, Vajpayee became the first person in 1977 to deliver a speech to the United Nations General Assembly in Hindi. Shri Vajpayee resigned from his post in 1979. The erstwhile members of the Bharatiya Jana Sangh came together to form the Bharatiya Janata Party (BJP) in 1980, with Vajpayee as its first President. He remained a Member of Parliament for 47 years — elected 10 times to the Lok Sabha and twice to Rajya Sabha. Shri Vajpayee’s signature in politics was achieving pragmatic consensus, and in this process he earned the respect of his party, allies and opponents. Abroad, he projected a harmonious image of India and connected it to the world through his foreign policy outreach. Shri Atal Bihari Vajpayee was born on 25 December, 1924 in Gwalior, Madhya Pradesh to a schoolteacher, Shri Krishna Bihari Vajpayee and Smt. Krishna Devi. 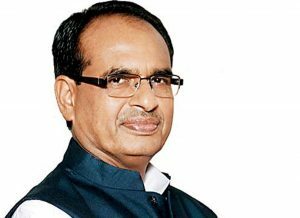 His birthday is celebrated as ‘Good Governance Day’ in the country. 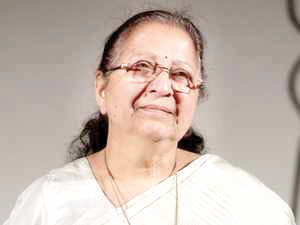 After schooling, he graduated from Victoria College in Gwalior, now known as Laxmi Bai College. He did his M.A. in Political Science from DAV College in Kanpur. 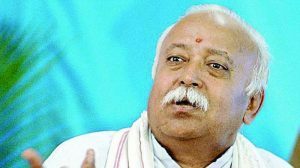 He became a full-time worker of RSS in 1947. Shri Vajpayee’s funeral procession or the final journey of the Poet-Politician was started from the BJP headquarters in the afternoon of 17 August and culminate at the Smriti Sthal where he was accorded a state funeral before his cremation. A sea of followers from across the country attended the funeral procession of Shri Atal Bihari Vajpayee as his mortal remains were taken for cremation to Smriti Sthal. Despite a hot weather in Delhi, lakhs of followers gathered on the streets and walked the 7-km stretch along with the BJP leaders to pay their last respects to the stalwart. Prime Minister Shri Narendra Modi and BJP President Shri Amit Shah, many CMs and Central Ministers walked along the mortal remains of Shri Atal Bihari Vajpayee from BJP headquarters till the end. Some climbed on trees to capture the moment on their phones as Shri Vajpayee’s cortege left the BJP’s headquarters for the last rites. Some thousand followers walked along, showering petals on the carriage of Shri Vajpayee. It was a sea of white, with most mourners dressed in the colour of mourning to remember the man who wove together pragmatism and his vision for an inclusive India. Some could be seen wiping their tears amid the chants of ‘Amar Rahe Atal Ji’ and ‘Atal Bihari Zindabad’. The intensity of the moment and the heat led to some mourners fainting. Prime Minister Shri Narendra Modi kept pace on foot with thousands of mourners as Shri Vajpayee’s funeral carriage drove to the Rashtriya Smriti Sthal a 7 km stretch where the great statesman was cremated with full state honours. 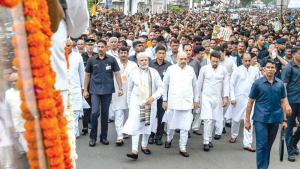 The Prime Minister and BJP President surprised many by joining the procession on foot from the BJP office along with lakhs of followers who spilled over barricades and jostled to get a glimpse of the former Prime Minister. 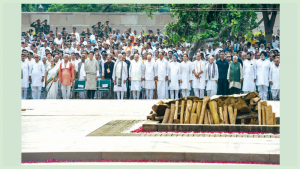 The illustrious and much adored former Prime Minister Shri Atal Bihari Vajpayee was cremated with the highest state honours as politicians across the spectrum were joined by leaders of foreign nations at the Smriti Sthal for the last rites of one of the tallest statesmen of India. The former Prime Minister was cremated with full military honours amidst the chanting of Vedic hymns and firing of a 21-gun salute by soldiers. President Shri Ram Nath Kovind, PM Shri Narendra Modi and Vice President Shri M. Venkaiah Naidu joined a galaxy of political leaders cutting across party lines in bidding adieu to the departed leader at the designated spot for the last rites of Presidents, Vice Presidents and Prime Ministers, on the banks of the Yamuna. 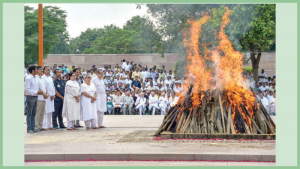 In a departure from tradition, Vajpayee’s foster daughter Namita Bhattacharya lit the funeral pyre as other family members accompanied her, including her daughter Niharika, as cries of “Atal Bihari Amar Rahe” ‘Vande Mataram’ and ‘’long live Atal Ji, reverberated and the Army performed the 21-gun salute. Prior to that the Tricolour draping Shri Vajpayee was folded and handed over to his granddaughter Niharika. Bugles sounded the last post, uniformed soldiers clicked their heels and a sombre silence fell over the crowd as Shri Vajpayee’s mortal remains were consigned to the flames. The sun set on the life of a poet-politician who combined politics of all ideologies with graciousness. President Shri Ram Nath Kovind, Vice-President Shri M Venkaiah Naidu, Prime Minister Shri Narendra Modi, BJP President Shri Amit Shah, Shri LK Advani, Dr. Murli Manohar Joshi, Home Minister Shri Rajnath Singh, Congress President Rahul Gandhi and former Prime Minister Dr. Manmohan Singh were among the thousands of people who attended the funeral at Rashtriya Smriti Sthal on the banks of the Yamuna. Several foreign dignitaries, including the king of Bhutan Jigme Khesar Namgyel Wangchuck, Bangladesh foreign minister Abul Hassan Mahmood Ali, Sri Lanka acting Foreign Minister Lakshman Kiriella and former Afghanistan President Hamid Karzai were also present at the event to pay their last respects to Shri Atal Bihari Vajpayee. Army Chief General Bipin Rawat, Navy Chief Admiral Sunil Lanba & Air Chief Marshal Birender Singh Dhanoa, also paid last tribute to Atal Bihari Vajpayee at Smriti Sthal in Delhi. Former Jammu and Kashmir Chief Minister and PDP leader Mehbooba Mufti, Bihar Chief Minister Nitish Kumar, Congress leaders Ghulam Nabi Azad, Mallikarjun Kharge and Anand Sharma, Lok Sabha Deputy Speker M. Thambidurai, former Union Minister A. Raja, MDMK chief Vaiko and TMC leader Dinesh Trivedi were among who witnessed the last rites at Rashtriya Smriti Sthal. 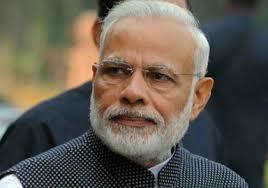 PM Shri Narendra Modi condoled the death of former Prime Minister Shri Atal Bihari Vajpayee who breathed his last. Condoling his death in a series of tweets, PM Shri Modi said he was speechless. “India grieves the demise of our beloved Atal Ji. His passing away marks the end of an era. He lived for the nation and served it assiduously for decades. My thoughts are with his family, BJP Karyakartas and millions of admirers in this hour of sadness. Om Shanti,” one of the tweets read. In another tweet the Prime Minister said it was Atal Bihari Vajpayee’s leadership that laid the foundation for a strong India, “It was Atal Ji’s exemplary leadership that set the foundations for a strong, prosperous and inclusive India in the 21st century. His futuristic policies across various sectors touched the lives of each and every citizen of India”. Mentioning the work done by the former Prime Minister, Shri Narendra Modi added in another tweet, “It was due to the perseverance and struggles of Atal Ji that the BJP was built brick by brick. He travelled across the length and breadth of India to spread BJP’s message, which led to the BJP becoming a strong force in our national polity and in several states”. Former Deputy Prime Minister Shri L K Advani expressed his deep grief and sadness and called Shri Atal Bihari Vajpayee as his “senior colleague and closest friend for over 65 years”. “Atalji will be remembered as the pioneer of the first ever stable non-Congress coalition government at the Centre and I had the privilege of working as his deputy for six years,” said Shri Advani. Shri Atal Bihari Vajpayeeji left an indelible mark in Indian politics with his ideas and principles. 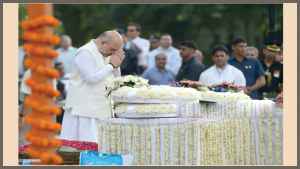 BJP National President Shri Amit Shah said while paying tributes to the stalwart leader. 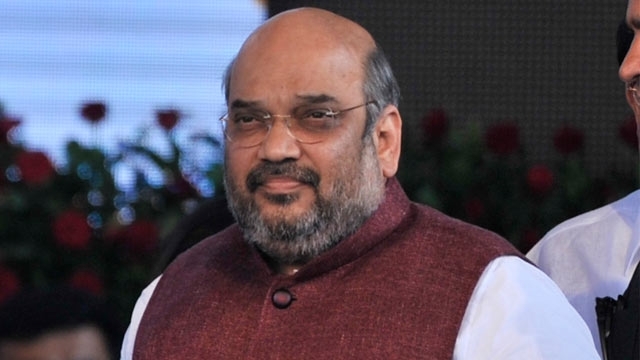 BJP President Shri Amit Shah paid heartfelt tributes to former Prime Minister Atal Bihari Vajpayeeji, saying he nursed the party to make it a banyan tree and left an indelible mark in Indian politics. “A rare politician, brilliant speaker, poet and patriot, his demise is not just a irreparable loss for the BJP but also for the entire country,” the BJP President said, adding that his thoughts, poems, foresight and political skills would always inspire and guide all. “On the one hand Atalji as the head of a party in opposition played the role of an ideal opposition while on the other hand he provided the country a decisive leadership as Prime Minister.” Shri Vajpayeeji left an indelible mark in Indian politics with his ideas and principles, Shri Shah added, while praying for the peace of his soul. “It was not easy to dedicate entire part of his life to the organisation and the ideology. In Atal Behari Vajpayee, we have seen a Swayamsevak, dedicated party worker, poet and great leader”. Atalji was a true ‘Ajatshatru’ who had many friends across the political spectrum. He believed in political consensus and his beliefs had consequential effect on Indian politics. In Atalji’s demise the nation has lost a stalwart who was known for statesmanship and astute leadership. It is also a huge personal loss to me. Saddened by the demise of Atalji, unquestionably one of the tallest leaders of India. His contribution to India and India’s democracy will be always remembered. His vision, oration, poetry, blended with his national commitment earned him respect from both friends and opponents. Atalji has left the world. But the era of which he laid the foundation will prosper even more. That is the Vajpayee legacy. With the sad demise of Shri Atal Bihari Vajpayee, an era has ended. He was liked by his opponents and loved by the party cadres. His amiability and generosity were the unique aspects of his personality. My heartfelt tribute to Shri Atal ji. “I remember those early days of BJP when under Atal ji and Rajmata ji I took my first steps into politics. Learning the ropes from the best, Atal ji’s wisdom and wit always proved to be an unmatched combination – his trademark style that India came to love”. From today onwards the New Raipur will be known as Atal Nagar. Atal memorial will be constructed on a five-acre area in the city. 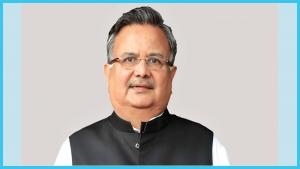 It is a true homage from the people of the state to Shri Atal Bihari Vajpayee who created the new state of Chhattisgarh and gave an identity to more than two and half crore people of the state. He may be not with us physically but his vision will always be with us, losing a person whom we always looked up to is a personal loss for all of us and I am sure we will always take inspiration from his ideology: #AtalBihariVajpayee. A great personality, a steadfast & universally accepted leader, who instilled Bharatiya culture & values in public life, Atalji has left us. The void left behind will remain forever. We join the nation in paying our deepest respects to the departed soul. Former PM Shri Atal Bihari Vajpayee’s death was mourned by several other prominent celebrities like Amitabh Bachchan, Rajinikanth, Lata Mangeshkar, Shah Rukh Khan, Priyanka Chopra, Sonam Kapoor and others. On his blog, Amitabh Bachchan described Shri Vajpayee as an ‘extremely rare human.’ “A stalwart, a poet, a writer, an enlightened mind and a compassionate being leaves this world and we mourn his passing. He was an admirer of my father and his works and there were many occasions when I would be present at their meetings”. I met him once in 2006. He was a very good orator. The void of his absence can never be filled by anyone in Indian politics; he has been a role model for everyone and inspired many through his poetry, speeches and oratorship. My Respect to him. Rest in Peace. For The Poet Prime Minister of our country, love you Baapji. “Extremely sad to hear of the passing of Shri Atal Bihari Vajpayee, our former Prime Minister and a true Indian statesman. His leadership, foresight, maturity and eloquence put him in a league of his own. Atalji, the Gentle Giant, will be missed by one and all #PresidentKovind.